TheRustedChain - The Blog: It's Monday. And it's going to require coffee. How's your day starting so far? For me, it will require lots and lots of Diet Dr. Pepper. Woke up at 4:15am stressing out about bills, lack of money, and a gazillion other things. Blessings to you on this gorgeous fall day! One cup already and more more as soon as the kids are off to school! we were up all night with wilder, who has the flu. heartbreaking. it's overcast here and i'm so tired. but i am hopeful for a great day! HILARIOUS pic! I overslept....infer the rest! Love that hair! :) Mine, a coke as soon as i can get this house picked up...gotta have something to motivate me to go get groceries! a cup o' chai is getting me moving. Lots of yard work is calling my name in prep for next spring's wedding. 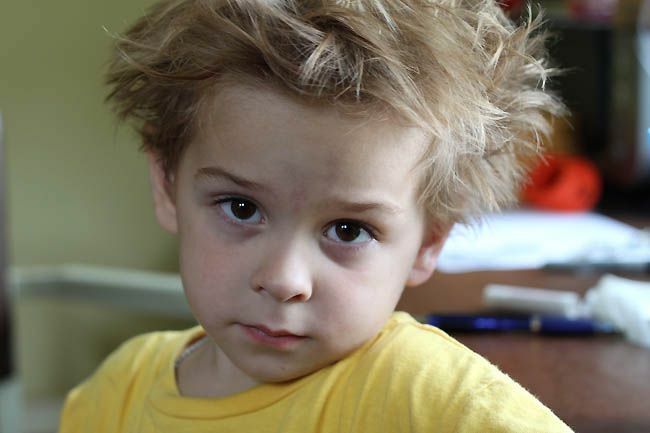 However your bed-head-faced-wonder is awfully cute. So cute! I've already had 2 cups of coffee this morning...hasn't kicked in yet. I would love to curl back up into bed. But that's a dream that will not be happening. Yeah, it's about like that. Now where's my coffee? my morning feels a bit like the boys hair looks. but i had a homemade latte on things are looking up. maybe i should have another for good measure? I am loving that baby boy....he is so stinkin cute! Love that hair! HA!! lots of coffee on board!! Oh how i wish I could have some strong, fully caffinated coffee goodness. Ill just have to try to fool myself with decaf. I had to laugh at this picture. I am sure I look like this most days. Especially without coffee, of which I am seriously addicted to and not seeking help at this time.